Home Soccer Odegaard points to Ajax: "I'm ready for the next step"
Odegaard points to Ajax: "I'm ready for the next step"
"When the season is over, I will make a decision and see where I can continue my progression," says the Norwegian, who will return to Real Madrid in the summer. 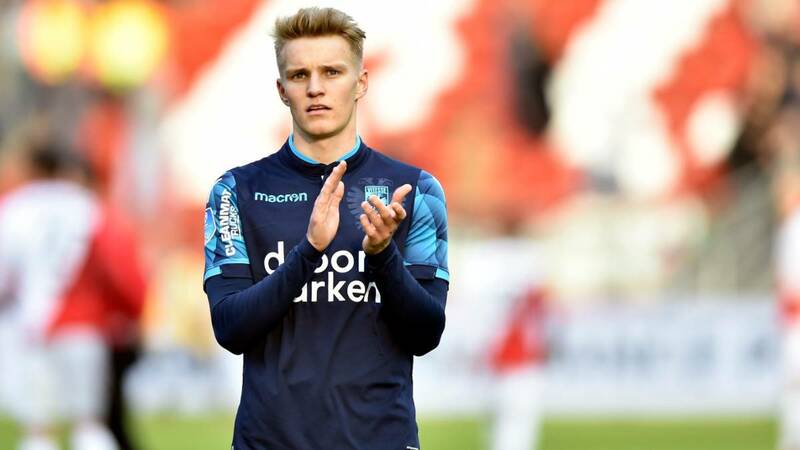 Martin Odegaard (20) has finally made the jump that was expected and is one of the most prominent players in the Eredivise, playing in the ranks of Vitesse. The Norwegian will return to Madrid this summer but has several clubs behind Interested level, including Ajax: "I'm ready for the next step, I want to continue growing", says in a statement published by the Dutch newspaper 'De Telegraaf'. Odegaard arrived at Madrid with just 15 years, after raffle half Europe ( Bayern, City, PSG ...) and with the sign of being one of the most promising players of the moment. His adaptation in Madrid, in Castilla de Zidane, was not easy. Your soldering of 1.5 million per year at such an early age and playing in Segunda B conditioned him. After a year and a half in which he did not find his site, in the season 17/18 was transferred to the Dutch Heerenveen, but it was a failure (2 goals and 4 assists). It seemed that the young Norwegian talent was stagnating. In the pre-season with Lopetegui (18/19) he did not clash, but came back on loan because of the absence of opportunities. EThis time, the destination was the Vitesse. Confianza, minutes and golazos. Odegaard has taken advantage of his second opportunity to excel in the Eredivise and get back in the spotlight of big European clubs. This season he has 8 goals and 6 assists in 31 games. He has become the leader of the team and a fixture in the Norwegian team of Lars Lagerbäck, where he already has 16 internationals with 20 years. Zidane wants to see Odegaard after his progression in Holland. Then decide. The Norwegian has a contract with Real Madrid until June 2021 but speaks of an offer from Ajax that could be around 20 million euros. The white club, as Zidane said himself, is going to seek this summer to cash in on the big signings he has planned. Odegaard may be one of the sales if he finally fails to convince Zidane in the preseason. "I have scored more goals and I have given more assists than last season, I think I have evolved for good, Slutsky (Vitesse coach) has given freedom and confidence When the season ends I will make a decision and see where I can continue with my progression but first I want to finish as well as possible in the Vitesse ". Odegaard was surprised by the elimination of Real Madrid at the hands of Ajax, its possible new Destination: "I do not miss a Champions League night, it's the stage I hope to play in. I'd also like to play in a great league, but I do not have to run too fast, I'm only 20. I still have a lot to go ... ".